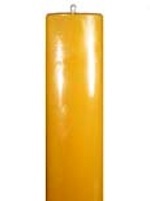 We have several offerings of three-inch diameter solid beeswax pillars. These are hand poured using only 100% pure beeswax from USA beekeepers. Please burn at least five continuous hours to prevent tunneling of your candle. Beeswax is clean burning and virtually smokeless when burned away from drafts. Please enjoy the wonderful lights of our beeswax pillars and remember to never leave a burning candle unattended!